This morning, after a long weekend spent staying warm in front of the stove with his buddy Coz, Sweet Milo succumbed to whatever disease he had been secretly battling and passed away in the vet’s office. During his last few months, while not in perfect health, he enjoyed many affectionate visitors who loved having him warm their laps. 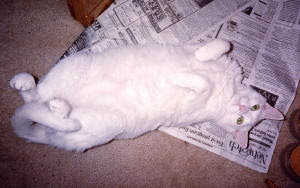 In a household of three other cats, Milo certainly didn’t get a lot of attention, but he was never one to complain. He was forever looking forward to his best buddy Bill returning to scratch his neck once again. Milo (along with Otis) was adopted by Joe and Eric while in college. Please give them both an extra hug today. You were a good boy, Milo. Oh, "little fat buddy" you will be missed. I have fond memories of seeing his face peering up at me from under the lid of the trash can in the kitchen (the same face that frequently was colored by whatever leftovers he got into on the counter, including hot wings!). He was a character, and he has earned his place in kitty heaven. Such a handsome boy - I'm so sorry. I'll give my boys an extra hug tonight in his honor. Noes!!!!! Oh, sweeties, I'm so sorry. :sniff: Sharon may have loved to step over him, but I loved to be sucked in by his gravitational pull. Please know that I'm hugging you both, and thinking kitty thoughts. Is Milo the one you used to try to get to walk on the treadmill? R.I.P. Milo. You will be missed! So sorry. My thoughts are with you, humans and furboys alike. 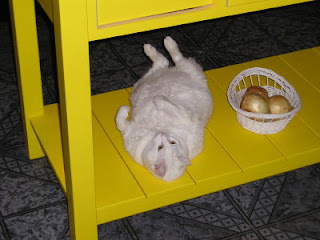 I have been honoured with two white cats in my life--the sweetest, gentlest animals I've ever known--so I felt a real connection with Milo, who was exactly the same. I'm proud to have shared my lap with him. I am so sorry Beth. Being any cat mommy myself, I know how attached we can get to the little fur balls. Ah, shoot - I'm sorry Beth. Oh I'm so sorry to hear about Milo "the pillow". 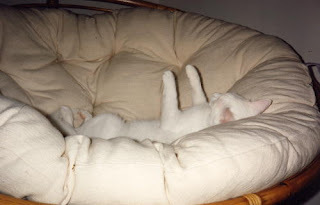 I'll never forget walking up on him in the middle of the night and thinking you had put a big white pillow at the top of the stairs so we wouldn't fall down them while heading for the bathroom in the dark. He was a very useful cat. We'll all miss him.